Teaching A level Mathematics (TAM) is a sustained professional development course, designed to support the development of teaching skills and subject knowledge of teachers new to teaching AS/A level Mathematics. The Teaching A level Mathematics (TAM) course has been designed to support teachers of GCSE Mathematics who wish to teach A level Mathematics for the first time. However, many teachers with experience of teaching A level Mathematics have enrolled on the course, often on the recommendation of colleagues who have completed TAM, in order to deepen their subject knowledge and gain new ideas for teaching. There are 10 different groups running this year at a wide variety of venues. Select from the table below to view details of the group running nearest to you. London and Manchester are running multiple groups; you will be allocated to one after you apply. Please note that your start date may change, depending on which group you are allocated. All our venues are chosen to be central locations which are accessible by public transport and we encourage you to consider using public transport where possible. You may choose to have an overnight stay, particularly when attending pairs of days. You will need to organise this yourself and should be able to find suitable accommodation nearby. In order to participate in TAM, you must be teaching in a state-funded school or college in England. In addition, applicants must have a minimum of two hours or two lessons per week of AS/A level or IB Mathematics on their timetable for the whole academic year. This teaching should include the teaching of some pure maths content within AS/A/IB level Mathematics (i.e. not only statistics and/or mechanics content). The teaching must be timetabled lessons to an entire class and the applicant must be the member of staff who has sole responsibility for planning and teaching this content and these lessons every week. Please note that small group tutorials, revision groups or team teaching are not acceptable. Please see our criteria for offering places document for more information. The course fee for TAM is £600. The fee covers the course days, two years access to MEIs online Integral resources, including additional extensive course materials, and textbooks covering A level Mathematics content. Every year we have responded to the requests of participants and offered additional support to meet their needs in areas such as the effective use of dynamic geometry and anticipate that such events would again be planned during 2019-20. If you are working in a state-funded school or college, participation in this course attracts a reimbursement of course fees plus £300, subject to engagement and completion of the course. Schools and colleges located within Priority Areas are eligible to receive a further subsidy of £300 to support staff cover and travel costs. I am already teaching A level Mathematics but would like further ideas and a deeper understanding of the pedagogy. Is this course for me? The course is primarily designed for teachers who require support in order to teach A level Mathematics for the first time and would otherwise not teach at this level. However, many course participants in the position described in the question say that they have benefited from the course, having gained deeper insights and that their A level teaching has become far more effective. I have booked my summer holidays. What work needs to be done over the summer? We recommend that participants work on the content of AS maths between enrolling and the start of the new school year so they are ready to teach these topics, as most participants expect to do, at the start of the autumn term. We recognise that many participants will take long holidays so no course days or compulsory tasks are scheduled for this time. Over the 15 months of the course (incorporating two summer holidays for private study) you will be expected to learn the content of A level maths with various elements of support including website resources and email support. The amount of time this takes will depend largely on how challenging you find this material. What happens on course days? At the start of the course, you will know which topics will be covered on each course day. In advance of each course day there will be suggested work to help you prepare for the day in the form of working through part of a textbook chapter, looking at online resources or reading an article to stimulate your thinking. 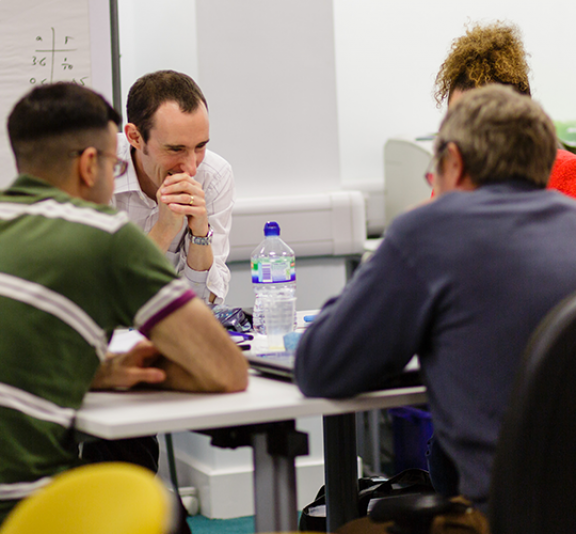 On a typical course day there will be three maths sessions (focussing on the pure maths content of A level maths and with a specific focus such as use of questioning, use of ICT, insights through multiple representations, differentiation, group work, assessment, etc). In addition there will be at least one session when the group reflects on the experience and how it can be adapted for use in your own classrooms. For some course days, participants are required to prepare short presentations to describe to a small group of peers the impact of a resource or teaching approach on their students. What happens if my timetable changes during the year? If you no longer meet the teaching requirements as outlined in the eligibility section or 'criteria for offering places' document then you will need to withdraw from the course immediately. You are able to complete the TAM Certificate. The elements which comprise the TAM Certificate are actively participating in all course days, completing two school-based lesson observations and completing two maths assignments. The two maths assignments are based on exam-style questions. These are requested by the participant and emailed out on the requested day. The participant then has seven days to complete the assignment before returning it in the post to the marker.